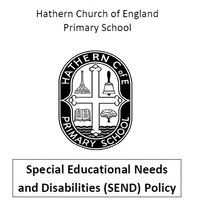 At Hathern, Special Education Needs and Disabilities (SEND) is managed and coordinated by Mrs Bratton (SENDCO) with administrative support provided by Mrs Williams. 2. Education, health and care plans (EHCP) will replace statements of special educational needs. New assessments for additional educational needs will follow the EHC guidelines from September 2014. (Existing statements will remain in force until all children and young people have completed the transition, which will be within three years). 3. School Action and School Action Plus will cease and be replaced by a single school-based category for children who need extra support, although schools in Leicestershire will also use the SEN Support Plan, which is aimed at young people with special educational needs and/or a disability who still require a person centred and holistic approach to meeting needs but, do not have the complex difficulties requiring the complex arrangements required under an Education, Health and Care Plan. These children will have long term special educational needs, supported by advice from external agencies such as Psychology Service, Specialist teaching Service. In light of these changes, a new Special Educational Needs and Disabilities Policy has been developed. Click on the link to the right to view the document. We have worked with other schools, both primary and secondary, in the area to develop a Local Offer for Hathern CE Primary School. Details of what can provide for pupils with a Special Educational Need or Disability can be found by clicking the link.